A well-landscaped yard is a great way to improve your home’s curb appeal and increase its value. Creating a beautiful space that you enjoy spending time in is also a great way to make memories with friends and family. Many homeowners tend to push landscaping off because of the expenses associated with turning your vision into an enjoyable reality, but that doesn’t have to be true. 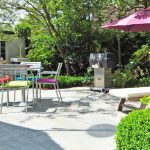 Here are eight low budget landscaping ideas that are simple to create and won’t break the bank this summer. Accent sidewalks and driveways with borders that incorporate planting rocks, concrete slabs, plastic barriers, or even using a different color mulch than what is in your flower beds. Each of these is relatively low in cost and help sharpen the appearance of your landscaping. Another person’s trash can quickly become a treasure for your yard. Check local flea markets, yard sales, and online marketplace sites for pieces that you can refurbish into a piece of art for your yard or flower beds. Some ideas include antique bathtubs, ceramic jugs or crocks, or even old farmhouse windows. Crushed stone and garden rocks are a great idea if you live an area where the grass is difficult to keep green or your property is broad and flat. Adding stone fills up space and adds depth to your land. You can also use stone under pavers or stepping stones as a border in your yard. Consider ground cover instead of grass. Spruce up large areas of grass by adding groundcover instead. Planting ground cover is also a great way to save money if you recently purchased a new home and had no grass currently planted. Planting grass is relatively expensive with the initial planting investment and ongoing water and fertilizer. Bishop’s weed and lamium are popular choices that withstand various climates and cost around five dollars per plant. Buy young plants or trees. Plants, trees, and shrubs can add levels and depth to your landscaping endeavors. But, buying and planting medium size trees costs about $200 per tree. If you want to create shade on a budget, you will want to buy young plants and trees to save money. Use pallets to create outdoor necessities. The use of pallets is a trending landscaping strategy because of the low costs involved. Check with local stores for discarded pallets. In most cases, stores give them away because otherwise, they get thrown away. Use pallets to build seating areas, storage areas, and even a beautiful compost area. Stepping stones are lower in cost and quite useful, making them a popular choice for many DIY landscapers. Consider them for pathways to entrances or, if you have numerous gardens in your backyard, you can use stepping stones in between them. It is a great way to liven up your yard with simplistic detail. A rock garden is an inexpensive way to add an extra layer of uniqueness and culture to your backyard. Buy a variety of different sizes of rocks, pick a space, and layer them on top of one another. Looking to spruce up your backyard this summer season? If you are in need of stone, mulch, or brick for an upcoming landscaping project, contact Morris Brick & Stone today and find the perfect element for your space!